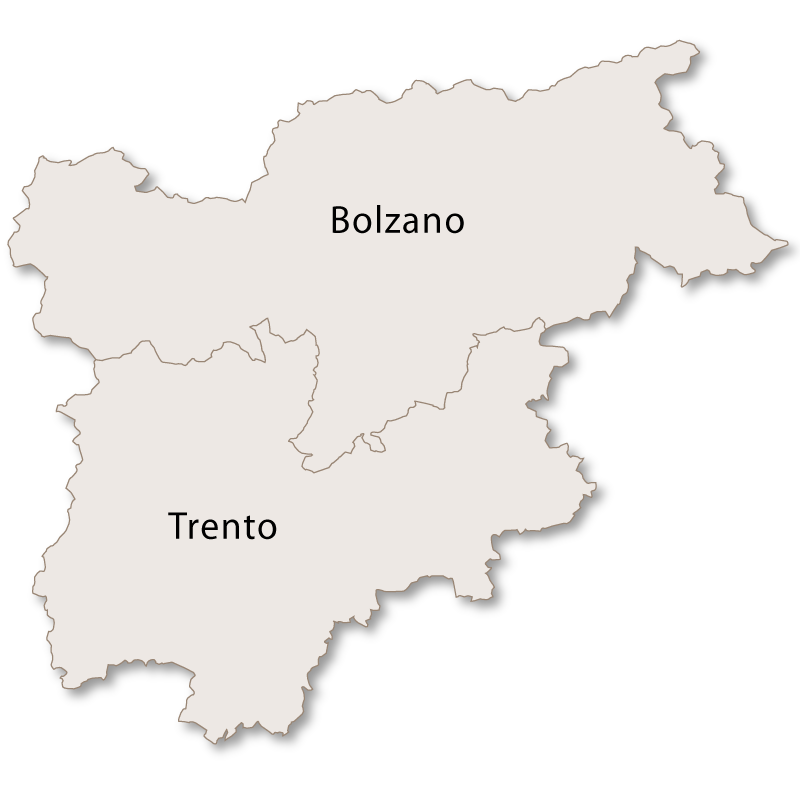 Lying directly south of the province of Bolzano, the province of Trento covers an area of 6,214 sq.km. 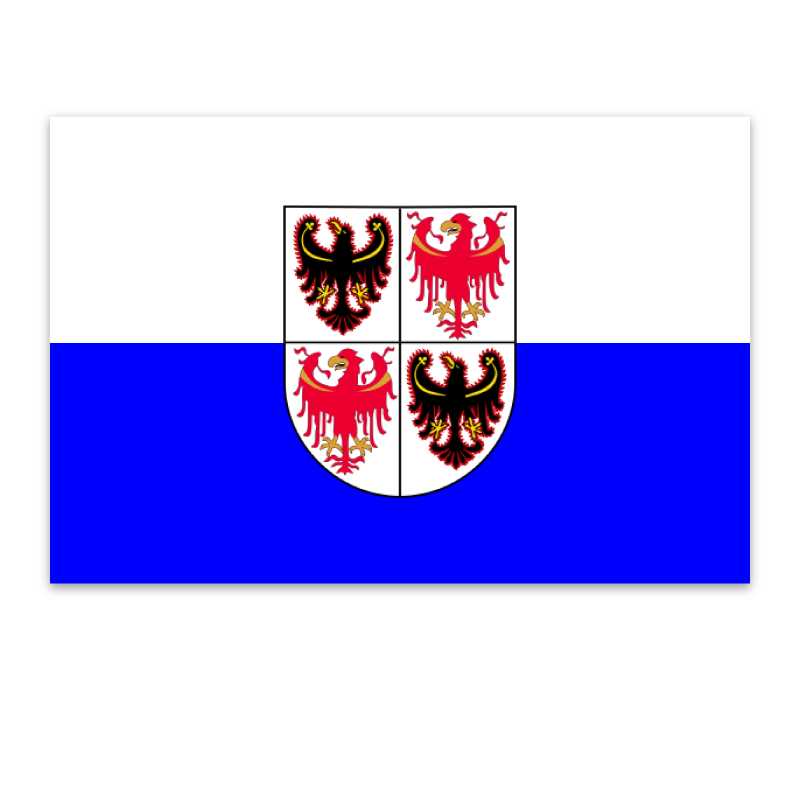 It is bordered to the north by the province of Bolzano, to the west by the region of Lombardy and to the east by the region of Veneto. The province is very mountainous and is renowned for its stunning landscapes and the quality of its snow which makes it a lucrative and popular destination for skiers. The whole province is dotted with well equipped ski resorts and miles of ski slopes. The vegetation is lush, the climate mild and this province has the added bonus of bordering one of the shores of the beautiful Lake Garda. 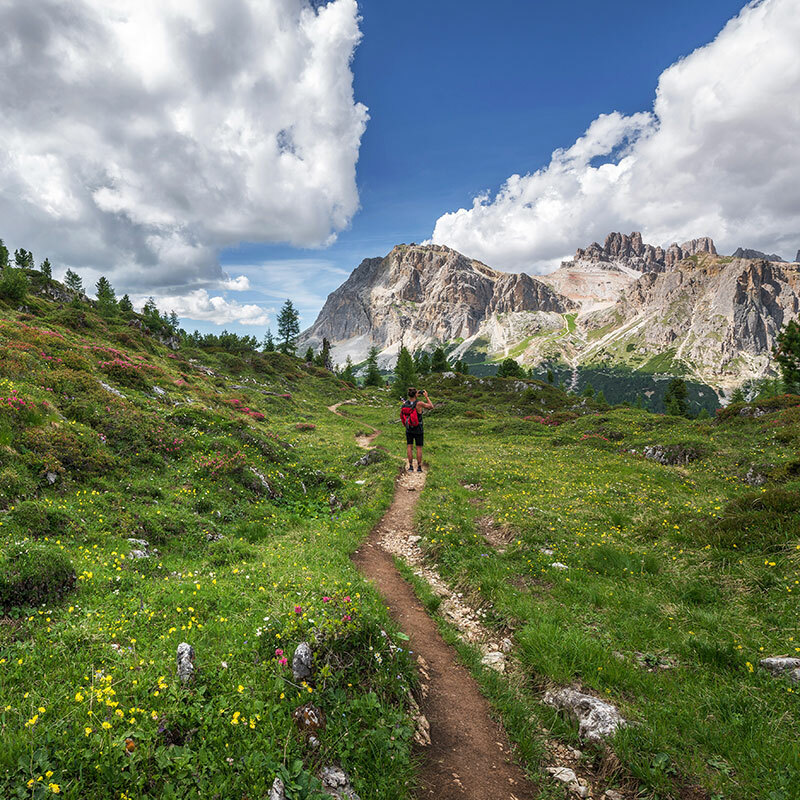 These factors contribute to the fact that the province of Trento has a healthy tourism industry all year round and not only in the winter months. 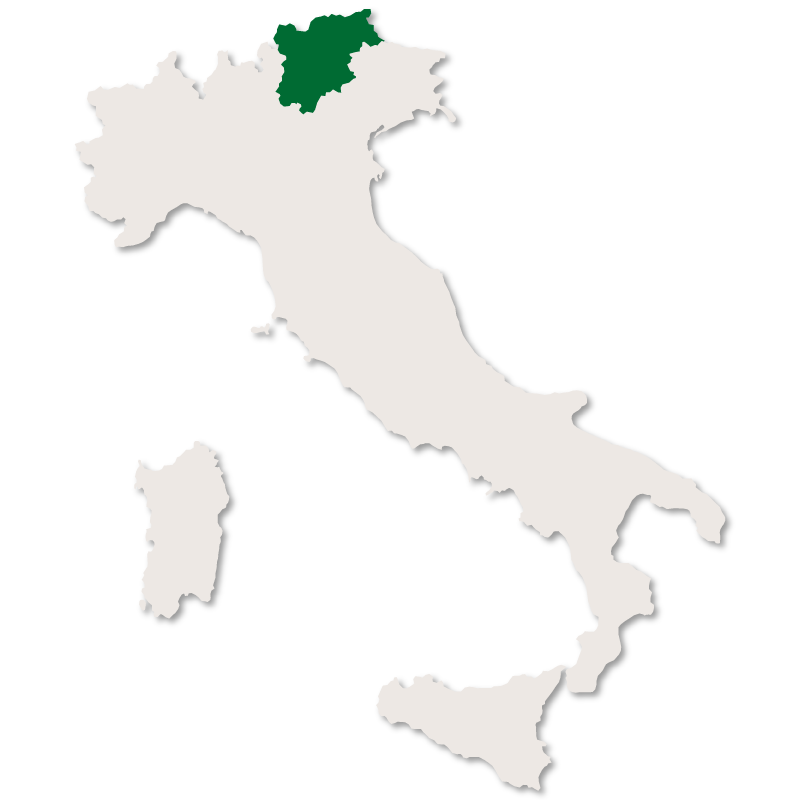 The whole province is full of productive apple orchards and produces just over one tenth of the apples for the rest of Italy. 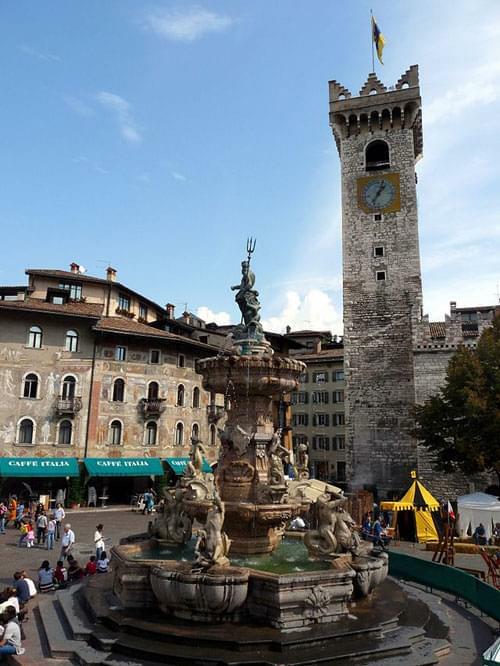 Trento is the capital city of the province of Trento and is a university town and educational, scientific, financial and political centre. It is a sophisticated with modern facilities and a high quality of life with plenty of job opportunities. It is one of the wealthiest cities in Italy and its residents enjoy a high standard of living. Although it has somehow never become a popular tourist destination the small, historical city centre contains some unique and pretty buildings. The medieval and Renaissance buildings have all been restored and are now all painted in their original pastel colours with pretty wooden balconies. The centre was once enclosed by city walls and towers but only parts of these are still visible today. The Cathedral of Saint Vigilius - a Romanesque-Gothic cathedral built in the late 12th century, built on top of a Roman basilica which can still be seen in an underground crypt. Fontana di Nettuno - a Baroque fountain built in 1767. Church of Santa Maria Maggiore - built in 1520 in the Renaissance-Gothic style. It has an outstanding 16th century portal and some unique art and frescoes within. Other notable churches are the Church of San Pietro (12th century), the Church of Sant'Apollinare (13th century) and the Church of San Lorenzo (12th century). Palazzo delle Albere - built on the shores of the Adige river in this Renaissance villa now hosts a modern art museum. Palazzo Pretorio - this 12th century palace has a bell tower (Torre Civica) is home to a collection of baroque religious paintings. Other palaces and houses of nobility are the Palazzo Salvadori (1515), the Palazzo Geremia (late 15th century) and the Palazzo Lodron. There are several musuems in the city including the Museo dell'Aeronautica Gianni Caproni and the Museo Tridentino di Scienze Naturali. This is a small town but very important and during the latter half of the 20th century was one of the most famous ski resorts in the province. Resting on a plateau between two mountains, Piz Galin (2442 metres) and Paganella (2125 metres), it is one of the wealthiest towns in Trentino, mainly thanks to its excellent skiing facilities. 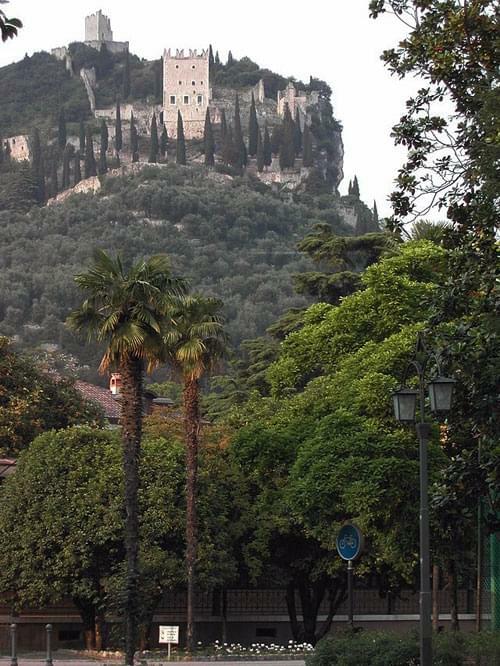 Close to Lake Garda this pretty town is topped by a medieval castle and is totally protected on one side by a sheer limestone cliff. This cliff is popular among rock climbers and the 'Rock Master' is a famous rock climbing event held there every year. Mountain biking is another prominent sporting activity in and around the town and cyclists from around the world flock to this location all year round. The medieval castle which overlooks the town is well worth a visit as is the late 15th century Sanctuary and convent of Santa Maria delle Grazie. Church of Sant'Apollinare - this church houses some interesting 14th century frescoes. Palazzo Marchetti - 16th century palace. Palazzo dei Panni - late 17th century palace. Two other well known and excellent ski resorts in this province are Cavalese and Folgaria. In this town there are two interesting sets of caves, Grotta della Bigonda and Grotta Calgeron, as well as two prehistorical archaeological sites. Dominated by mountains this town has a distinctive Austro-Hungarian fort of San Biagio overlooking it. Ragoli is one of the richest communities in the region Trentino Alto Adige and is well known for its lavish culture and food festivals. As well as beautiful scenery Malosco has a 12th century castle, the church of Saint Tecla (1228) and several old houses which once belonged to nobility. Lying along the shores of Lago di Molveno at the foot of the Paganella mountains this pretty village has a lot to offer. Lago di Molveno was formed over four thousand years ago as the result of an avalanche. 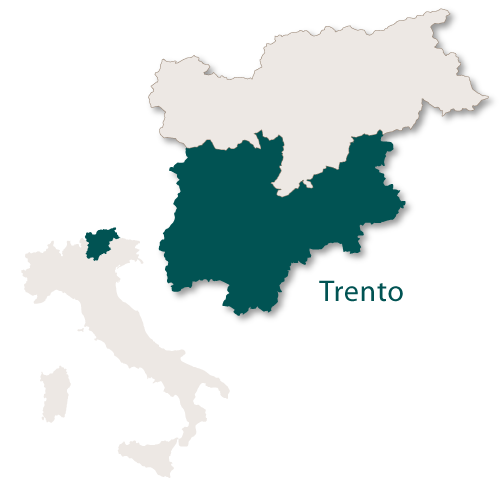 It is the second largest lake in Trentino covering an area of 3.3 sq.km and has a depth of 123 metres. Resting just above Lake Garda and stretching down to its shores is the lovely village of Torbole. 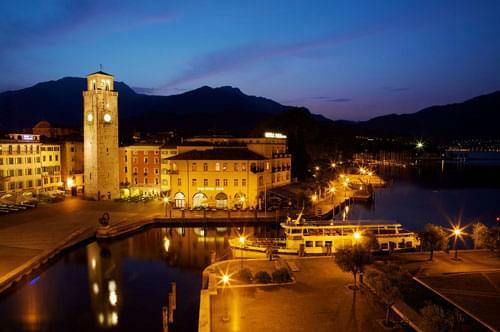 It has a pretty harbour full of colourful fishing boats and because of its shape and position is often referred to as the amphitheatre of Lake Garda. Situated on a grassy plain in the Val di Non, backed by the Maddalene mountain range and overlooking Lake Santa Giustina the town of Revò is not short of stunning scenery. Located at the north western corner of Lake Garda and at the southern edge of the Italian Alps Riva del Garda is renowned for its magnificent sunsets. On the edge of the lake it has a medieval fortress with quadrangular bastions and a drawbridge. There is a musuem housed within the fortress. Torre ApponaleOnce enclosed by medieval walls Torre Apponale has some interesting city gates which are still standing. Porta San Marco was built by Venetians in the 11th century and the Porta San Michele was built in the 13th century. The town also has a medieval belfry (Torre Apponale), several old palaces and some interesting churches. The Chiesa dell'Inviolata is one of the most beautiful Baroque churches in Trentino. Rovereto is an ancient fortress town resting in the Vallagarina valley by the River Adige. There is a 13th century castle with an informative war museum (Museo Storico Italiano della Guerra) within its walls. This town also has the second largest swinging bell in the world, the bell of Maria Dolens which rings every day in remembrance of the dead. Tenno is home to the Cascate del Varone, spectacular waterfalls from the River Magnone which runs underground before reaching Lake Garda. The falls are over 100 metres high and have been open to the public since 1874. 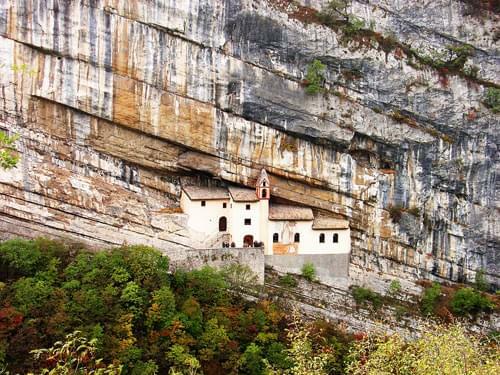 Trambileno is the location of the Eremo di San Colombano monastery, a striking church resting on a rock ledge. According to legend a hermit, San Colombano, arrived there and killed the dragon that had been causing the death of all the children who had been baptised in the waters of the local river. The monastry is only accessible by a flight of 102 steps carved into rock.